Today I've got another instalment for my unofficial Cousin Corp week. Amongst the wonderful package of goodies that Cousin sent me is a packet of silver beadelles. I fell in love with these as soon as I saw them.... you know, there's nothing like dangling a bit of bling in front of a girl to dazzle her! 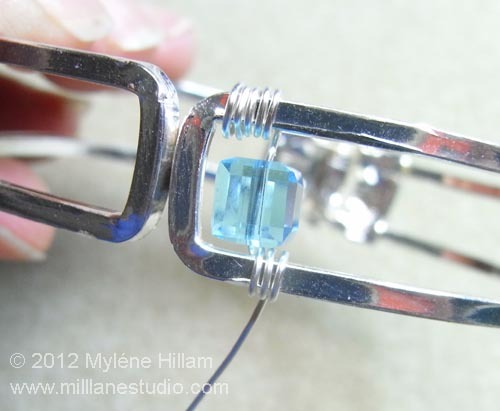 But to make this piece pop even more, I've added some turquoise crystal cubes from my own collection. 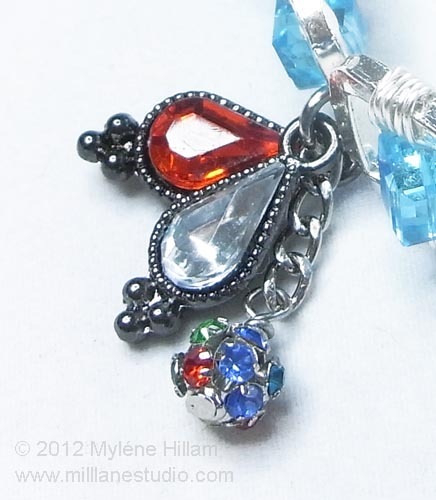 I'm working over a bracelet form which will be perfect for the style of bracelet I have in mind. I've also used 24 gauge non tarnish silver wire. 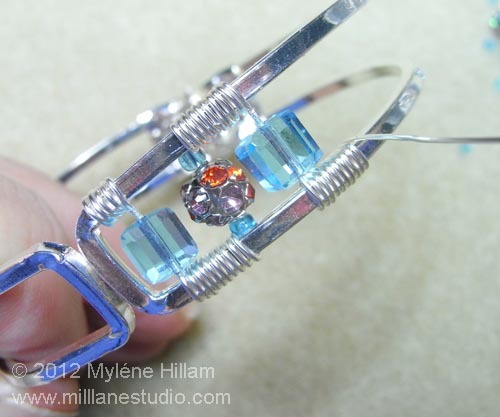 Getting the wire wrap started is the hardest part of this bracelet. I used my flat nose pliers to hold the wire in place whilst I wrapped over the tail to make sure it was secure and then trimmed it away. After that, it's easy. After 5 wraps add a Crystazzi cube and then secure it firmly in place by wrapping the wire around the other side of the bracelet form. I've wrapped it 10 times but you can do it any number that suits your bead size. Thread on a seed bead (from the Crystazzi packet), a beadelle and another seed bead and wrap the wire around the first side of the bracelet form 10 times. 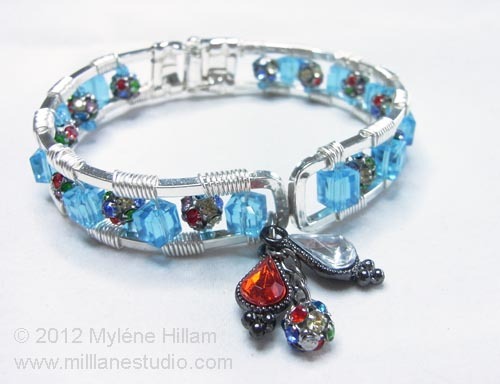 Continue adding beads and wrapping the wire around the bracelet until you get to the end of the bracelet. Because my bracelet is hinged I've worked the bracelet in two halves. 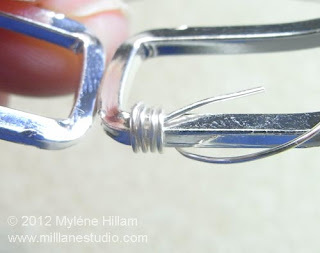 To end the wire I tucked it in neatly at the hinge so that the sharp end doesn't dig into your skin. Then cut another length of wire and repeat on the other side of the bracelet. And the finishing touch is a cluster of metal and crystal drop charms from the Jewelry Basics range and another beadelle on a length of chain. This is a great style of bracelet; it's elegantly simple, yet has plenty of bling and lots of detail - perfect for day wear but equally suitable for evening. What more can a girl ask for? Where did you get the hinged bracelet form? I haven't seen many of these in my local bead shops. They have them in two widths. Good luck!